The other day, I was craving one of my favorite pizza toppings – homemade basil and walnut pesto – but my food processor had broken, and the new one had yet to arrive in the mail. 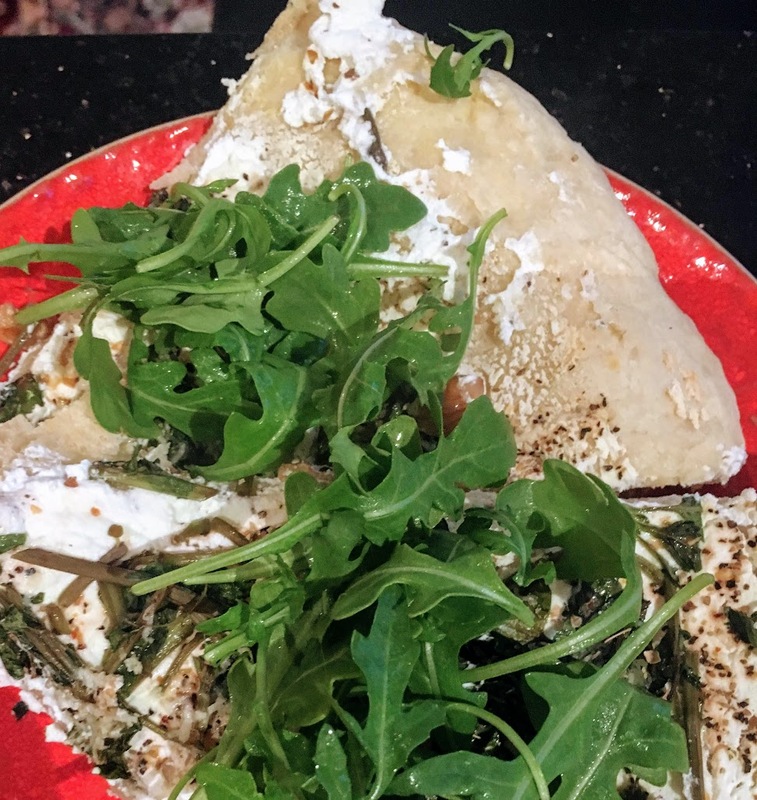 So I prepared a pizza with deconstructed pesto: whole basil leaves, coarsely chopped walnuts, and grated Parmesan, sprinkled over a layer of creamy ricotta cheese. I drizzled on some olive oil and seasoned the pizza with freshly ground pepper and salt. The ricotta really shines in this recipe, so use a high-quality variety, if you can. Prepare the dough: Pour warm water into a large bowl. Add sugar and yeast, and stir gently to dissolve. Set aside in a warm place for about 15 minutes, until fluffy. Add olive oil, flour, and then salt. Stir ingredients together until a shaggy dough forms. Adding a little bit of flour at a time as needed, knead the dough until it is elastic. It should spring back when you poke it with your finger. Cover bowl with a kitchen towel or plastic wrap and let rise in a warm place for at least two hours (if the dough starts to rise out of the bowl, gently push it down.) The longer the dough rises, the better the flavor; for best results, prepare dough the day before you plan on baking the pizza, and let it sit in the fridge overnight in a covered bowl or in a gallon-sized plastic ziploc bag. Remove from the fridge and warm up to room temperature before working with the dough. Prepare the toppings: Preheat oven to 475 degrees. Place dough on a baking stone or baking sheet. Stretching dough out with your hands, shape into a circle of whatever thickness you prefer. Spread ricotta over the dough, leaving a thin border. Drizzle ricotta with a bit of olive oil and sprinkle with salt, black pepper, and red pepper flakes. 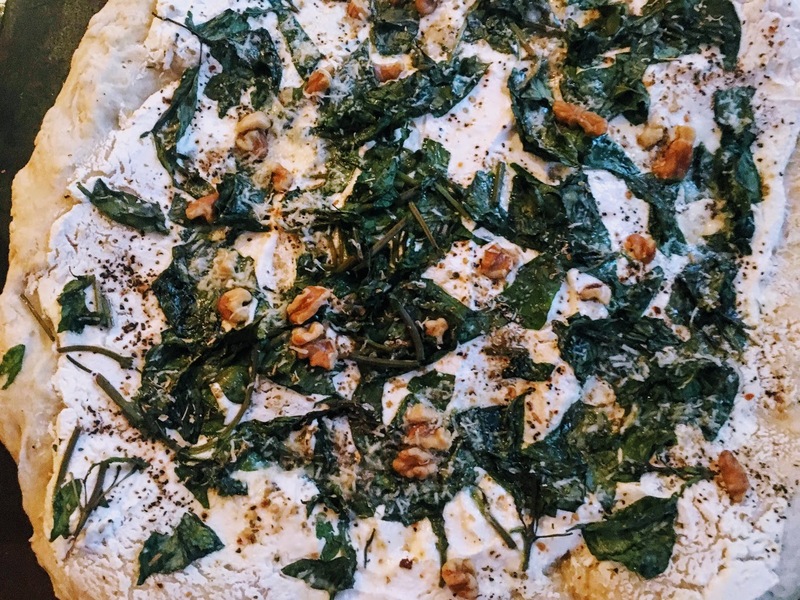 Scatter basil leaves and walnut pieces over the surface of the pizza. Sprinkle on Parmesan, to taste. Using a pastry brush, coat crust with olive oil. Bake: Bake for around 20-25 minutes (your pizza may take more or less time, depending on its thickness) until bottom and edges of crust begin to turn golden brown. Cut into slices and serve with fresh arugula.